Appeared on theHRDirector (HRD) web site in https://www.thehrdirector.com/book-reviews/better-business-relationships/ in February 2019. “This book by Kim Tasso is a ‘must-have’ for any forward-thinking Human Resources function. The content forms an anthology of theories and practice centred on improving relationships with colleagues, stakeholders and clients. The format is very readable with a logical progression from ‘knowing self‘ through to developing team and client insights. As a seasoned HR practitioner of some thirty years’ experience, I found this a useful ‘aide-memoire’ regarding some of the tried and tested practices such as Neuro-linguistic programming (NLP) and MBTI but Tasso also gives the reader insight to newer thinking such as creating a personal brand. In today’s environment of several generations in the workplace, this book has relevance for many, regardless of starting point as a ‘digital native’ or not. I am currently coaching young professionals at work, relatively new to the Organisational Development discipline and I’ve recommended that as part of their development, they use Kim Tasso’s book as a lexicon of practice for today. Tasso’s style is straightforward, engaging and the useful summaries at the end of each section are concise. It is most definitely a book to have to hand to explore what tools might be available. What it is not, nor do I think is it intended to be, is a ‘how to’ guide with significant depth. I’ll be donating my copy to our workplace library as a very practical, readable, accessible guide”. “As someone who has recently transitioned from a career in healthcare to starting my own business in a new sector, I have had a steep learning curve, this book has been an invaluable tool during this time. I started the book initially by using it as a reference for topics as I needed them such as delivering presentations, networking and client relations – which helped me hone some skills needed for several expos I had to attend. I then read the book from start to finish and I can honestly say I found it all very interesting. Having previously studied psychology it was fun to revisit some of the theories layed out in the early chapters and gives enough detail for a newbie to grasp and then also shows where to find further information if you wish to delve further in to those topics. “Kim Tasso reminds us early on in her book that while no one teaches you about relationships, nearly every aspect of business life demands effective relationships skills. True enough. If you can create exceptional connections with your teams and your markets, you gain genuine advantage. This may explain why I jumped ahead to the section on “How to be liked”. So back to the question of “How to be liked”. Likeability guru Dale Carnegie is quoted in Kim’s book as saying, “You can win more business in two months by being interested in other people than in two years trying to be interesting.” And I do think that better business relationships begin with empathy. Listening with genuine interest and seeking to understand before seeking to be understood. Themes that run right through this book”. “General Eisenhower was selected to lead the team formulating, organising and executing the Normandy D-Day Landings – which, according to the Imperial War Museum website, was the largest naval, air and land operation in history. He was selected, not because he was the highest scoring general to come out of West Point but because of his renowned talent in managing difficult and challenging people – Roosevelt, Churchill, General De Gaulle, General Montgomery & General Paton – none of whom could be described as “easy” characters. So over 70 years ago the US military, not perhaps an institution noted for its appreciation of the “softer skills,” in management – for arguably the most important offensive mission on the Western front selected a man whom they knew exemplified such skills and was supreme in relationship management in order to “get the job done.” It is difficult to think of another example where the stakes were higher and it remains an important lesson for all of us who have an interest in management, business strategy et al. Despite this, helpful books on “business relationships” are few and far between – in some cases written by well-intentioned academics with minimal experience of working within business or indeed managing across diverse, multi-generational teams. In addition such efforts frequently confuse cause and effect. “This is a better book than the cover and subtitle led us to expect. Something about the cover just looked a bit too contrived, and the mention of psychology also made us wonder which direction this book was going to go into. Instead it actually proved to be a very comprehensive overview of a whole range of important business management issues. With a lot of good ideas, solutions, and options for those looking to deal with the challenges of dealing with a diversely motivated, and often remotely distributed workforce. Business success is reliant on being able to get on with people. No matter what role you have in an organization, the ability to influence, persuade, change, motivate and encourage others to act is vital. Better Business Relationships brings together a wealth of knowledge, insight and practical advice, from leaders in psychology and management to communications and sales, to provide insight and guidance to both new and more experienced business people, who may be dealing with both internal colleagues and external clients. With my life-long passion for psychology – spanning undergraduate studies, NLP training, psychometric assessments, professional coaching qualifications and counselling training – interwoven with three decades in the business world, this book is something I’ve wanted to write for a long time. The pace of technological development means that increasingly people communicate digitally so communication skills and the ability to form meaningful professional relationships is at risk of becoming a dying art. There is a generation gap – both the old and the new generations need to develop a deeper understanding of each other and adapt so that it can be bridged. There is increased diversity in the workplace – with more virtual teams with people from a variety of backgrounds and cultures. While working with business leaders as a strategic consultant and Non-Executive Director (NED) and also with those entering the workforce, I have been frustrated that there wasn’t a single source of information to guide them through the maze of communication and relationship challenges. My ambition was to create one book that covered a wide range of psychological ideas that would support better business relationships in an accessible way. Better Business Relationships is ideal for anyone who wants to improve their relationships at work and gain a greater understanding of critical social and communications skills required to succeed in any professional or business environment. 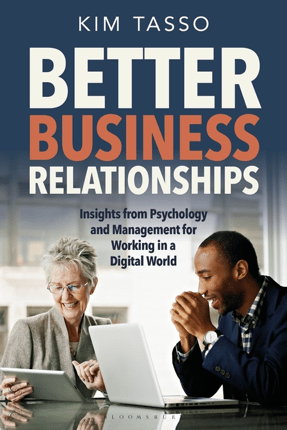 Better Business Relationships was published in September 2018. Further details from Bloomsbury: https://www.bloomsbury.com/uk/better-business-relationships-9781472957016/ The book can also be ordered on Amazon.